We’ve talked a bit already about our work with a vendor to make sure ArchivesSpace supports efficient workflows. After reading Mark’s blog post, I’m re-energized to think of the good this work will do — archivists in repositories will be able to do collection control projects in a far more robust and efficient way! Right now, we are deeeeeeeeep into this work. During our planning call last night, one of the software developers asked for use cases for some of our requirements for selecting and changing information about containers — I was going to just make a screencast and notes to put in our project management software, but it occurred to me that this could be useful information to document more publicly, especially since folks are asking about how ArchivesSpace can help them do their work more efficiently. Here are some use cases. An entire collection has been described, and I know for sure which containers I’ll be using. I’m now ready to slap barcodes on these boxes, tell the system what these barcodes are, tell the system what kinds of boxes I’m using (we call this a container profile), associate these boxes with a location, and associate an ILS holdings record identifier. In order to do this, I need an easy way of saying “yeah, I’m looking for boxes that belong to this resource” or even “yeah, I’m looking for boxes that belong to this series.” In our environment (and I know this happens elsewhere too), it’s very common for each series to start over with box 1. So, when I’m at the point of putting a barcode on a box, I need to be sure I know which box 1 I’m sticking that barcode on. Holy Cow! Look at all of those box ones! In Archivists’ Toolkit, if you want to do this work, you can only scope it to a single resource record. We know that it might be desirable to do bulk actions across several collections, so we want the option to scope this work to a single resource, but we don’t want to be stuck with it. This is really exciting because currently in ArchivesSpace, every time that you associate a container with a component (like “Correspondence from Anne Shirley to Diana Barry 1877”), you would have to enter the barcode anew. This obviously isn’t very efficient, and it can result in a whole lot of errors. In the workflow we’re proposing, you would be able to know that the box one for each of those components is the SAME box one, and you’d only have to enter the barcode once. Here’s another use case: Maybe I’m doing a shelf-read. I come to a location in my repository that’s described in a location record. But maybe the location associated with those containers in the database isn’t correct! I want a quick and easy way of selecting the containers in my repository that I see in that location and associating those with the appropriate location record. This is currently impossible to do in ArchivesSpace — in fact, it does a really screwy thing where if you look up a location (like “Library Building, A Vault, Row 1, Bay 1, Shelf 1” ) it gives you a list of all the archival objects there (in other words, intellectual description), not the containers! You don’t want to go into every intellectual description and update the repeating box information. This work would make it possible to say “Boxes 3, 4, 5, 7, and 10 from MSS.111, series 4 all belong in this location” and for the system to know that. I hope you’ve enjoyed this journey through how we want ArchivesSpace to work. Obviously, software development is an ever-changing endeavour, ruled by compromise and the art of the possible. So don’t take these use cases as promises. But it should give you a good sense of what our priorities and values are as we approach this project. Our user story for this is: “BULK SELECTION: As an archivist, I would like to define a set of container records that are associated with descendant archival_objects of an archival_object with a set Component Unique Identifier in order to perform bulk operations on that set.” which is obviously a perfect storm of software jargon and archives jargon, but basically we’re saying that we need to know which series this belongs to. Since series information is stored in the component unique identifier, that’s what we want to see. Hi, everybody. Long-time reader, first-time poster. I’m Mark Custer, and I’ve been working as an Archivist and Metadata Coordinator at the Beinecke Rare Book & Manuscript Library for just over two years now. This past year, most of my job duties have centered on ArchivesSpace. In addition to co-chairing Yale University’s ArchivesSpace Committee with Mary Caldera, I co-taught two ArchivesSpace workshops last year that were offered by Lyrasis, a membership community of information professionals, which was formed by the combination of two other regional consortiums. In October, I helped out at a Boston workshop as a trainer in training; and in December, I co-taught a workshop that was co-sponsored by the Rochester Regional Library Council and the University of Rochester. Looking back on the year 2014, then, what stands out most to me in my professional life is the increasing importance and necessity of partnerships. The Latin prefix co- was everywhere, and I don’t think that this notion of co-everything will be taking a backseat anytime soon. These partnerships are precisely the sorts of things that have me so excited about ArchivesSpace. To me, the most important thing that is emerging from the ArchivesSpace project so far is the community, not the system — don’t get me wrong, though, I’m extremely impressed by how the software has been able to combine the features and functions of Archivists’ Toolkit and Archon into a single project in such a short amount of time! I’d even venture to say that the community is not only influencing the development of the software by making itself known through its individual and institutional voices, but that the community is also showing signs that it intends to nourish and nurture that software with a collective voice. And, full disclosure, I’m also currently serving on the ArchivesSpace Users Advisory Council, so if you don’t agree with that statement, please let me know. Each of the instructors, myself included, as well as a few of the other participants, provided a few suggestions to this important question. What struck me by those answers, though, is that none of the suggestions were ArchivesSpace specific just yet. That shouldn’t actually surprise me, given the relative newness of ArchivesSpace – both the software and the community – but it does remind me that we have a lot of work to do. But it’s precisely this sort of work that I’d really like to see the archival community communicating more about in 2015. I’d love to hear how others would like to create efficiencies using ArchivesSpace, so please leave comments here or send me an email. I think that we need to strive for cooperative systems that promote cooperative data, including web-based documents, and I really do think that the ArchivesSpace community is poised to achieve those goals. So far you have probably seen posts by my colleagues discussing the efforts to make ArchivesSpace work in our complex multi-repository environment at Yale. To date, we have evaluated the application in its present form, hired consultants to develop additional functionality, and are currently engaged in extensive testing. However, in addition to trying to effectively implement ArchivesSpace, we have also needed to consider how we might work together more effectively. There are twelve discrete repositories at Yale that will be implementing ArchivesSpace. Currently many of these repositories work in their own instance of Archivists’ Toolkit or outside of an archives management system, and the archivists at each repository have developed some individual repository-specific methods for managing containers and describing materials. While we need to ensure that ArchivesSpace will work for us, in committing to a single, university-wide version of ArchivesSpace, the implementation of ArchivesSpace is providing us with a unique opportunity to further develop cooperation amongst the many repositories at Yale. Much of our work to this end has been straightforward. For example, in the summer of 2014, our Committee standardized the controlled vocabulary lists in ArchivesSpace. However, some of our work has been more complex and far-reaching. In the fall of 2014, we interviewed archivists at all twelve repositories about their practices, including their approaches to managing containers and locations as well as their description of archival material, particularly non-paper formats. While these interviews began with the explicit goal of gaining a better understanding of procedures at Yale so that our Committee could make sure that our implementation of ArchivesSpace met everyone’s needs, during our discussions regarding description it became apparent that current practices are widely divergent among campus repositories, requiring further cross-repository discussion regarding the description of born-digital materials, digital surrogates, and A/V materials. We have developed a task force consisting of archivists from multiple units on campus in order to determine basic guidelines for description of these types of materials. This task force will share its proposed description guidelines with all stakeholders at the University, responding to feedback and reaching consensus, with the goal of configuring Yale’s installation of ArchivesSpace to accommodate these guidelines. We look forward to updating you on our progress and sharing our guidelines once they are complete. In my last blog post, I talked a bit about why ArchivesSpace is so central and essential to all of the work that we do. And part of the reason why we’re being so careful with our migration work is not just because our data is important, but also because there’s a LOT of it. Just at Manuscripts and Archives (the department in which I work at Yale, which is one of many archival repositories on campus), we have more than 122,000 distinct containers in Archivists’ Toolkit. With this scale of materials, we need efficient, reliable ways of keeping physical control of the materials in our care. After all, if a patron decides that she wants to see material in one specific container among the more than 122 thousand, we have to know where it is, what it is, and what its larger context is in our collections. Many years ago, when Manuscripts and Archives adopted Archivists’ Toolkit (AT) as our archival management system, we developed a set of ancillary plug-ins to help with container management. Many of these plug-ins became widely adopted in the greater archival community. I’d encourage anyone interested in this functionality to read this blog post, written at the time of development, as well as other posts on the AT@Yale blog (some things about the plug-in look marginally different today, but the functions are more or less the same). In short, our AT plug-in did two major things. At Yale, we create a finding aid and a MARC-encoded record for each collection*. 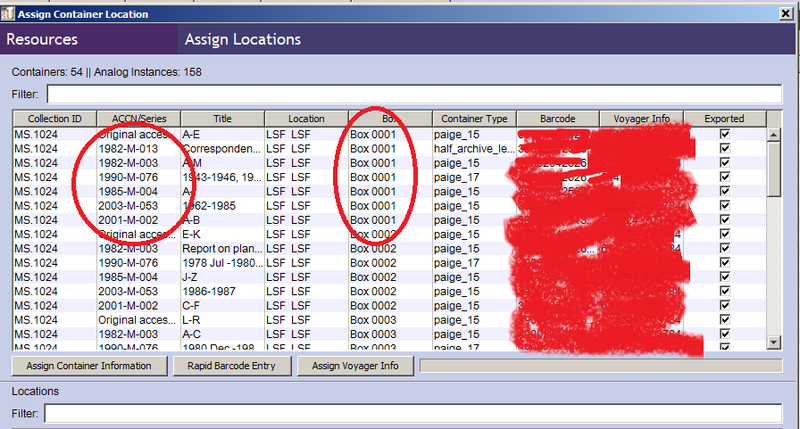 In the ILS, we also create “item records” for each container in our collection. That container has an associated barcode, information about container type, and information about restrictions associated with that container. All of this information needs to be exactly the same across both systems, and should be created in Archivists’ Toolkit and serialized elsewhere. Part of our development work was simply to add fields so that we could keep track of the record identifier in our ILS that corresponds to the information in AT. It let us assign information that was pertinent to a single container all at once (and just once). In Archivists’ Toolkit (and in ArchivesSpace too, currently), the container is not modeled. By this I mean that if, within a collection, you assign box 8 to one component and also box 8 to another component, the database has not declared in a rigorous way that the value of “8” refers to the same thing. Adding the same barcode (or any other information about a container) to every component in box 8 introduces huge opportunities for user error. Our plug-in for Archivists’ Toolkit did some smart filtering to create a group of components that have been assigned box 8 (they’re all in the same collection, and in the same series too, since some repositories re-number boxes starting with 1 at each series), and then created an interface to assign information about that container just once. Then, in the background, the plug-in duplicated that information for each component that was called box 6. This wasn’t just about assigning barcodes and Voyager holdings IDs and BIBIDs — it also let us assign a container to a location in an easy, efficient way. But you’ll notice in my description that we haven’t really solved the problem of the database not knowing that those box 8’s are all the same thing. Instead, our program just went with the same model and did a LOT of data duplication (which you database nerds out there know is a no-no). Unfortunately, ArchivesSpace doesn’t yet model containers, and as it is now, it’s not easy to declare facts about a container (like its barcode or its location) just once. Yale has contracted with Hudson Molonglo to take on this work. Anyone interested in learning more is welcome to view our scope of work with them, available here — the work I’m describing is task 6 in this document, and I look forward to describing the other work they will be doing in subsequent blog posts. We’ve also parsed out each of the minute actions that this function should be able to do as a set of user stories, available here. Please keep in mind that we are currently in development and some of these functions may change. Once this work is completed, we plan to make the code available freely and with an open source license, and we also plan to make the functions available for any repository that would like to use them. Please don’t hesitate to contact our committee of you have questions about our work. * We (usually/often/sometimes depending on the repository) create an EAD-encoded finding aid for a collection at many levels of description, and also create a collection-level MARC-encoded record in a Voyager environment. This process currently involves a lot of copying and pasting, and records can sometimes get out of sync — we know that this is an issue that is pretty common in libraries, and we’re currently thinking of ways to synchronize that data. Metadata creation is the most expensive thing we do. I hear myself saying this a lot lately, mostly because it’s true. In the special collections world, everything we have is unique or very rare. And since we’re in an environment where patrons who want to use our materials can’t just browse our shelves (and since the idea of making meaning out of stuff on shelves is ludicrous! ), we have to tell them what we have by creating metadata. Creating metadata for archival objects is different than creating it for a book — a book tells you more about itself. From a book’s title page, one can discern its title, its author, who published it. Often, an author will even write an abstract of what happens in the book and someone at the Library of Congress will have done work (what we call subject analysis) to determine its aboutness. In archives, none of that intellectual pre-processing has been done for us. Someone doing archival description has to answer a set of difficult questions in order to create high-quality description — who made this? Why was it created? What purpose did it serve for its creator? What evidence does this currently serve about what happened in the past? And the same questions have to be addressed at multiple levels — what is the meaning behind this entire collection? What does it tell us about the creator’s impact on the world? What is the meaning behind a single file collected by the creator? What purpose did it serve in her life? Thus, the metadata we create for our materials is also unique, rare, intellectually-intensive, and essential to maintain. Here, as part of a planning session, Mary and Melissa are talking through which tasks need to be performed in sequence. Currently, we use a tool called Archivists’ Toolkit to maintain information about our holdings, and this blog is about our process of migrating to a different tool, called ArchivesSpace. Because, like I say, the data in ArchivesSpace is expensive and unique, we’ve taken a very deliberative and careful approach to planning for migration. We’re lucky to have a strong group, with diverse backgrounds. Mary Caldera and Mark Custer are our co-chairs, and have strong management and metadata expertise between them. Melissa Wisner, our representative from Library IT, has a background in project management and business analysis. She was able to walk us through our massive project planning, and helped us understand and make sense of the many layers of dependencies and collaborations that will all have to be executed properly in order for this project to be successful. Others on the group include experts in various archival functions and standards. And beyond this, we have established a liaison system between ourselves on the committee and archivists from other repositories at Yale, so we can make sure that the wisdom of our wider community is being harnessed and the transition to this new system is successful for all of us. Anyone interested in viewing our project timeline is welcome to see it here. We know that other repositories are also involved in transition to ArchivesSpace, and we would be happy to answer questions you may have about our particular implementation plan. contribute to the ArchivesSpace community. 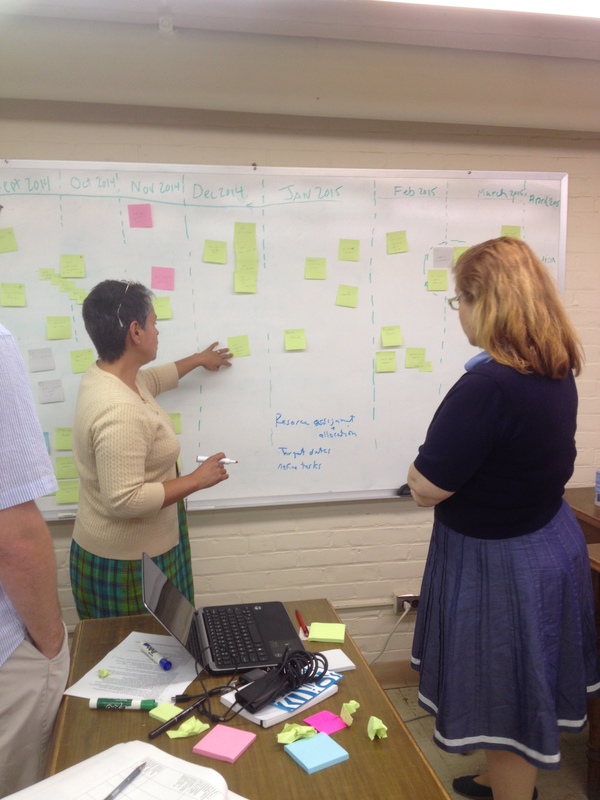 To learn more about Yale’s ArchivesSpace Committee and implementation visit our Web site! We will also share our scripts and plug-ins via GitHub, but that is a few months away still.